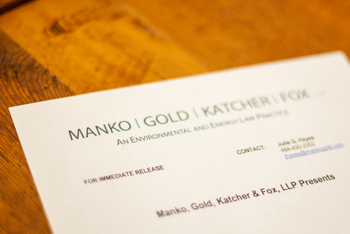 Philadelphia, PA (January 8, 2008) – Manko, Gold, Katcher & Fox, LLP (MGKF), an environmental, energy and land use law firm in Bala Cynwyd, announced that attorney Todd D. Kantorczyk has been named partner. An associate at MGKF since 2004, Kantorczyk has focused his practice on litigation and regulatory compliance counseling, covering a wide range of national, state and local environmental programs. His areas of concentration include air, climate change and energy matters, as well as "toxic tort" litigation.